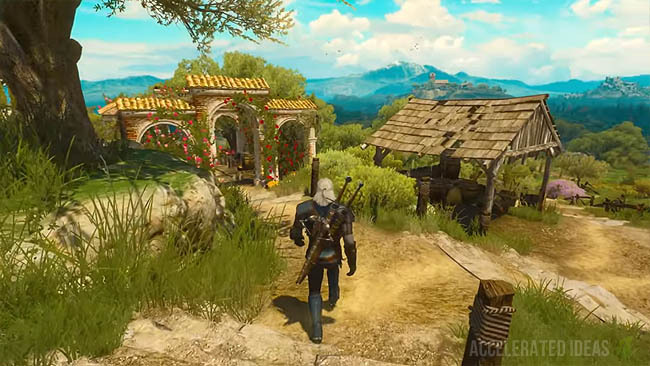 Geralt gets his own "home" known as Corvo Bianco in the Blood and Wine expansion for the Witcher 3. This vineyard can be upgraded and renovated with unique features such as a stable, library, chemistry station and many other beneficial additions. The vineyard is given as a free reward for accepting the main Blood and Wine contract but it's in quite a state; the brickwork is cracked, the gardens are nothing more than dirt patches and the inside is a depressing mess. That's the point though - right from the start of the expansion you as the player have the option to purchase upgrades for the building and the surrounding area. In fact, one of the expansions quests called "No place like home" asks the player to restore Corvo Bianco to it's former glory. Some of these renovations are purely cosmetic additions, in a kind of Sim's like experience, whilst others provide meaningful buffs to Geralt and his horse. Cosmetically, the house can be kitted out with various stands to show off your most prized possessions: showcase your armour, swords, books and even hang paintings to liven up the place. To make things easier, the player stash has been added to the vineyard making it convenient to pick out the items you want and place them throughout. On the feature side, choose to plant a garden and then harvest herbs for use in potion-brewing. Build a stable and Roach gains a stamina buff. 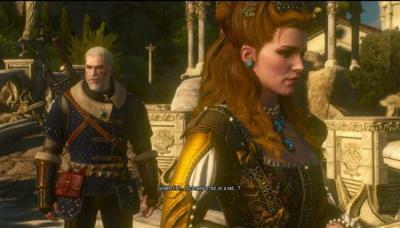 Or choose to refurbish a guest bedroom to invite Triss or Yennefer over for dinner and a bit of you know what! Along with the free estate comes a dedicated butler figure called Majordomo who not only plays Gwent with you but also willingly accepts large sums of money to initiate any of the renovations you desire (I'm sure that guy's taking a cut!). Simply select the "Think we could do some renovating" dialogue option to start the first "general renovation" which takes three days to complete. In addition to money, each additional renovation requires X amount of elapsed game time to complete. You can happily revisit the area frequently to see how the workers are getting along as they sweat away in the blistering sunshine. Some will even talk to you as most NPC's would. This first renovation costs 5000 gold but it unlocks weapon stands, armor stands, the ability to hang paintings and access to the basement. From there can invest in an Armorer’s Table for 1,000 Gold (24 Hours to build) and a Grindstone for 1,000 Gold (24 Hours to build). Upgrades are not cheap mind you, with most requiring gold in the region of thousands to complete. Therefore it's a long and gradual investment that'll see you channel funds received from quests straight into your new home, piece by piece. With enough investment and time, Corvo Bianco can be transformed into an amazing place that's lavishly decorated with your most hard earned trophies and gear. It's a place to show off your prized possessions and gives sentiment to those amazing stories that you've spent so many countless hours working through on your Witcher 3 adventure.